If your monitors are in the wrong order or not showing, here is how to fix it. 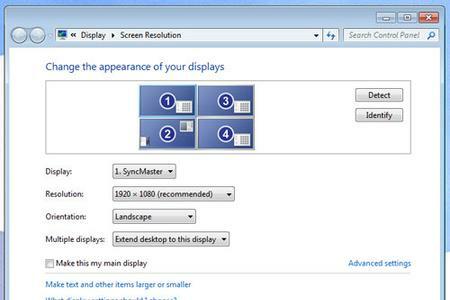 To activate and/or arrange your Multi-Monitors, you have to get to Screen Resolution Settings. Just right Mouse Click on the desktop background and select Screen Resolution (Windows 7) Display Settings (Windows 10). First, make sure all of your monitors are activated. If one or more of your monitors are grayed out like #4 in this example, it is not ‘active’. To make it active, go into your Screen Resolution settings and choose Extend Desktop to This Display. Hit Apply to save changes before proceeding. Note that if monitors are not connected at the time of booting your PC the video card will temporarily make them inactive. Also note that it is normal for displays to flicker temporarily while changing settings. Screen Resolution settings are completely independent for each display. To adjust these settings, select monitor #1 for example by selecting that icon, and change the resolution to your preference. Repeat the step above for EACH of the other displays as necessary. Now that all of your monitors are active, lets make sure they are in the right order. You will know right away because your mouse will not move between the monitors correctly. Once all monitors are active, click on the Identify button. Note the LARGE WHITE NUMBERS that pop up on your screens. They will only show for a couple seconds so you may have to click on identify again. Write down the order of the LARGE WHITE numbers as they pop up on your screen.